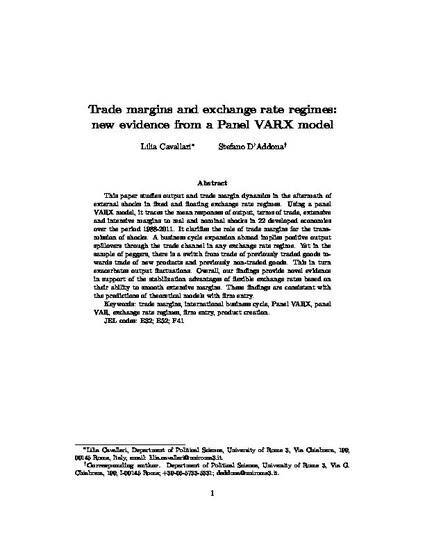 This paper studies output and trade margin dynamics in the aftermath of external shocks in fixed and floating exchange rate regimes. Using a panel VARX model, it traces the mean responses of output, terms of trade, extensive and intensive margins to real and nominal shocks in 22 developed economies over the period 1988-2011. It clarifies the role of trade margins for the transmission of shocks. A business cycle expansion abroad implies positive output spillovers through the trade channel in any exchange rate regime. Yet in the sample of peggers, there is a switch from trade of previously traded goods towards trade of new products and previously non-traded goods. This in turn exacerbates output fluctuations. Overall, our findings provide novel evidence in support of the stabilization advantages of flexible exchange rates based on their ability to smooth extensive margins. These findings are consistent with the predictions of theoretical models with firm entry.